BACK COVER SAYS: " There will be a time when men will fight among themselves in the name of God, when peace will fail; at that time a part of me will re- emerge." SWARNALI SPEAKS: I have always loved mythology. And as expected the great Indian epics have always been a source of fascination for me. So when I saw this book up for review at Blogadda, I knew I had to read it. The book is an attempt at retelling the well known epic tale ofThe Ramyana. 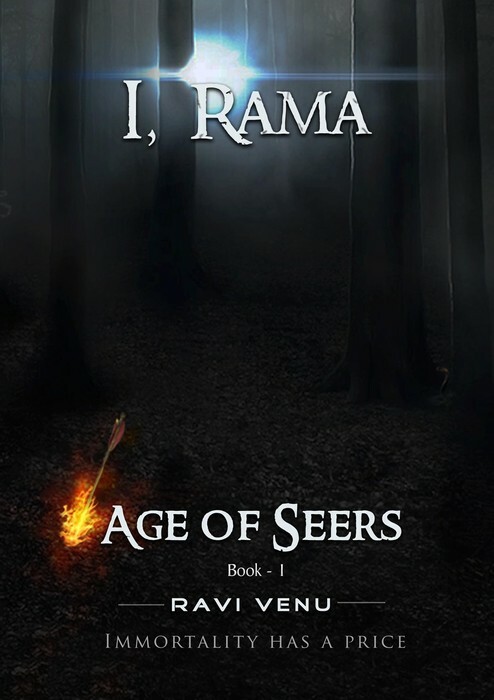 As the very title of the book says, the book is Rama’s perspective of the world around him. Rama is at almost the end of his life and he is reflecting on this past. The narrative is in first person which is very different to the third person omniscient narrator view in Valmiki’s original version. The narration is in flashback mode which is not linear as Rama tells his story to his sons Lava and Kusha and to his friends. What I really liked about the book is the amount of research work behind it; particularly the work done on some of the characters. The author has shown Rama’s step mother Kaikeyi in a very different light in his version. All those who have read the original epic would know her as a woman who sent away the virtuous Rama to “vanvaas” under the influence of the scheming Manthara, to make way for her son Bharat to ascend the throne of Ayodhya. But here in this book she is shown as a warrior princess with an immense strength of character. Apart from her character, those of the Rishi Vishwamitra and Rama’s wife Sita are portrayed with a lot of details. Another thing I liked about the book is that the author has tried to maintain a very scientific approach to the story telling. The stories of the origin of Ganga and the life process on earth were very fascinating to read. I honestly appreciate the author’s attempt but the book fails in certain parts. For one thing, a book is not just what the author writes; the presentation is also an important part of it. The book has been very poorly presented, the cover is just plain unattractive, says nothing about what’s inside. Then when you open it, the lines just start so abruptly, margins and header space is not well formatted. The book contains some typo errors which can be over looked though. Now, this could have been extremely beautiful if it was written in Hindi or maybe in some Indian language but it simply loses its charm when told in English. In a nutshell, the book is a good attempt at retelling a known story. But it does fall short in certain areas. The narrative doesn’t move very fast and it turns out to be a little boring for a reader like me. But for those who love mythology and don’t mind reading very descriptive passages, this book might be a great read. i do love mythology but i guess i would prefer reading about d mahabharata instead. that's more of a favorite :) are u planning to read d next book in d series? ?